Why CONTENT is King in the Web Development Realm! People seem to think that website content is last on the list of priorities when building a website. Unfortunately, they couldn't be more wrong!! 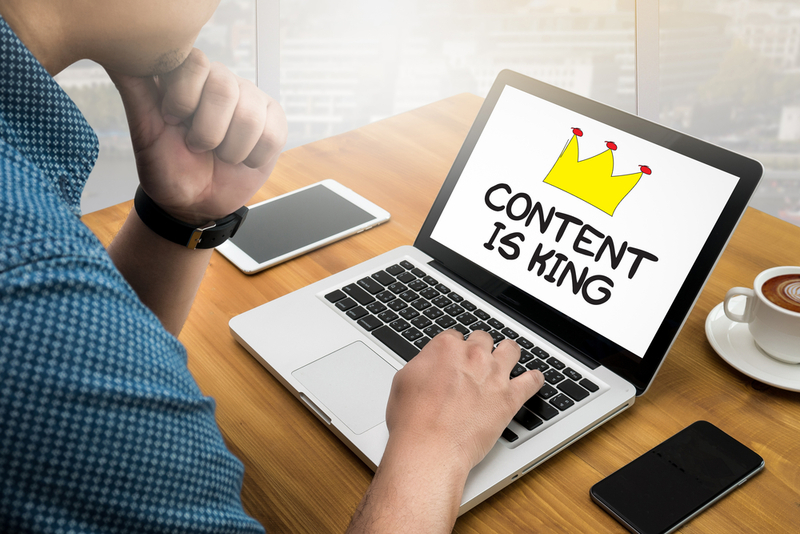 CONTENT is the king of the kingdom in regards to a websites success or failure on the internet. It's not simply a string of words put together. Well-written content has multiple benefits. It attracts search engines, increases site traffic and provides useful information to existing and potential customers. People use the Internet to get information about products, services, places... you name it, and the web has information on just about anything you can think of. It is a powerful information source. It's essential to make sure you are being perceived in the best possible way. Well written content is what sets your website apart from the masses and delivers the right message into the hearts and minds of your customers. Indeed, a successful website is determined primarily by its content. Ultimately, content wins the opinion of your customers. All other components of your website (design, visuals, videos, etc.) will provide a strong secondary support role, as great design will only enhance its effectiveness. Central Coast Web Design provide excellent content writing services and this is what we can do for your website. Content for your website needs to be relevant and engaging as well as comprehensive. You need to inform your viewer what your business is all about, how you operate, the services and products you offer. The more you tell, the more you sell. Create solutions that meet a need. Engage and entice your viewer through your content. Persuade, coax, seduce, invite them to stay and connect further with your business or product. The information you provide can be a powerful tool that will help generate more business if you let it. However, it's important to remember that people read information differently on a computer to a newspaper or book. Ensuring your content is broken up into small sections with clear headings enables the viewer to scan and retain their attention span at the same time. Be clever in your layout and headings as this can be just as important as the other words on the page. One of the benefits of publishing good content is that it will increase the number of people who find your website through search engines. A good content writer knows that search engines look for keywords, key phrases, titles and descriptions in search results. SEO is about user experience. It's delivering the right content for the right users, and making sure that they have a positive and rewarding experience. Relevant keywords, titles, taglines, descriptions and meta-descriptions all add to the power of your website on the internet and where it sits within google rankings. A good content writer knows how to ensure your content is being maximised for this purpose. For example, taglines and slogans need to be customer-centric (i.e., focusing on the needs and wants of the customer). This is essential to grabbing the attention of your prospective customers. Your taglines must deliver a clear value proposition and include an effective call to action. The key to a successful website is having clear, relevant and keyword-rich content that delivers the right message with power and conviction. The content on your website should target your audience, engage them and persuade them to take action. Search engines love content, especially frequently updated content, and if you want to get people to your site, it's important to provide content that people want to see. News articles, blogs, videos, tutorials, hints and tips on doing something better all help increase traffic to your site. Increasing Users time on your website "site stickiness"
A content-rich site increases site "stickiness" and entices your customers to return again and again. It could give them helpful information that is relevant to their business or interests. Effective content doesn't always come in the form of text. Content also comes in the form of photography and video. High quality photography can make a good web presence great. Video can also tell a story in a way that text sometimes cannot. Videos on websites are changing the way important messages are communicated. Website visitors expect to get the information they need without effort. Custom Videos provide a great way to engage audiences and drive important messages in a format that requires less effort than reading large amounts of text. In addition, illustrations, infographics, diagrams and interactive presentations are often used to explain difficult concepts and assist users in their decisions. It's important to note however that the word descriptions that accompany these images will receive better rankings on search engines than the images themselves. A good web developer and content writer knows this! I don't know why for many people website content is considered the least important aspect of web development - because in our opinion it is the main contributor to ensuring a strong online presence. It's what can persuade your website visitors to take action, and what Google indexes so other people can find you. It's what shapes the design of your site - and it needs to be taken seriously! Call us today and see how we can help make your website content a powerful online presence that will communicate, motivate and activate potential customers to your business or product.